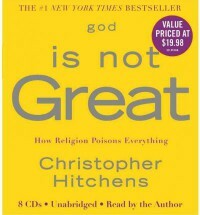 One might fault Hitchens for using too broad a brush to condemn religion but his point is that any institution or belief – no matter how beneficent its dogma* – that demands that an individual surrender choice and freedom of conscience to an outside power for which there is no evidence is profoundly wrong and immoral. ** Any such belief represses or – worse – perverts the best in human nature and leads to needless misery (“religion poisons everything,” as the author reiterates several many times). Whatever utility religion may once have had (and I’m not sure Hitchens would have ever credited it with any at any time), humanity is capable of moving beyond it and standing on its own two feet. The species is not a three-year old who needs daddy to tell it how to behave or what to do. And Hitchens is passionate in his belief that we need to dispense with all such nonsense. I can’t say I disagree with Hitchens because I don’t, though I don’t see his call for a new Enlightenment making any serious headway. We are in an era of fundamentalisms and voices of reason, tolerance, mercy and compassion are drowned out by people unwilling to admit anyone’s right to freedom of conscience. ** Indeed, the existence of so many mutually contradictory revelations and the often sordid histories of their origins is evidence of their manmade geneses. *** Not that I was in any danger of nodding off as I cruised down the Santa Monica freeway, the subject matter was too interesting.